Has anyone managed to convert and old TP2 script or produce a new script that sends the currently selected email in Mail to the current TP3 file? Where would you like it to end up in the active TaskPaper file ? An Inbox: project, for example ? I currently send them into an “Inbox:” project (in TP2) but it is interesting to consider your suggestions. I typically have about 6 or 7 unchanging project titles so a dropdown or similar menu with a default of “Inbox:” would probably be an improvement. I think a rule based on sender would have less applications for me but maybe for others it would be useful. I’ll take a look in a day or two, and sketch something up. My guess is that if you select several things from the same correspondent, mixed in with other stuff, the Inbox should probably show things grouped by sender ? 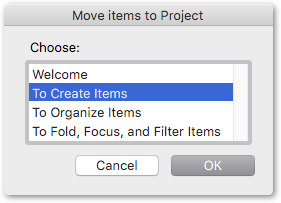 On help with which projects they go to next, I think it’ll probably be more sensible for me to write a separate script for generally selecting TaskPaper items, throwing up a menu of target projects, and letting you choose which project to move them to. (on grouping and sorting of multiple messages - I’ve thrown in a couple of functions for that at the top the script, but they are not in use yet - let me know if grouping and/or sorting sounds more useful than confusing. Sometimes magic just makes a mess, like ‘auto-correction’ ;- ). // Perhaps only mutations of existing material undo ? withTitle: "TaskPaper file not saved"
The sequence of message elements is just right in my opinion. Separating the processes of moving messages to the Inbox: and then placing them into projects would probably work just as well as combining them. In some cases tasks/ messages would just stay in the Inbox: until completed, as they may not need to be assigned to a project, or a suitable project may not yet exist and need to be created first. I think grouping by sender is the behaviour I (and other users?) would “expect” to see and I think it would be a useful addition. I agree with you about auto-correction; it’s like trying to shovel smoke with a pitchfork in the wind! Thanks again, I owe you a Guinness. return (editor.selection.selectedItems.length > 0) ? // PROJECTS IN ACTIVE DOCUMENT ? // USER CHOICE OF TARGET PROJECT ? I’ll take a look at the grouping of mail by sender. Ver 0.2 of the Selected Mail Items -> TaskPaper Inbox: script (above) just sorts the incoming mail by sender and time received – it doesn’t group under sender headings. Would sender headings make sense ? If you use the script a second time before clearing the previous batch, perhaps additional mail from an existing sender should join its heading-grouped predecessors ? (An alternative would just be to re-sort the contents of the whole inbox (by sender and received) each time the script runs). Update: Ver 0.3 keeps the whole inbox sorted (A-Z sender, then New-Old received) when new material arrives, and fixes a glitch which ignored the script if only one email was selected. The chronological ordering of the message carries useful information and is a definite benefit in terms of organising items and/or deciding the order that items are actioned. I was thinking about the helpfulness of grouping child items under a sender header. On one hand it would seem like typical behaviour for an outliner-type application. On the other it could potentially make the list items appear a bit busy. Also an original message with subsequent messages included as child items underneath its not strictly a regular sort of hierarchy, unless you had something else in mind. I suppose the answer to the question “If I manually indented these messages to keep them all under a sending header would it help and could it be done automagicallly? (sorry ;))” would indicate the best approach. I generally try to keep task items for each project at the first level of indentation but other cases may differ. If that seems to work we can leave it, unless you would prefer to go for strict chronology. Ah yes of course A-Z first and then recent --> old, is just right. I think you have the balance right as it is. For me this is a such a useful function and for many others too I’m sure, great work! Newbie question: how is this script run? I can use Keyboard Maestro, but thus far, I can get the script to work. Any suggestions? Thank you @complexpoint — I have it working now, using the posted macro. Is it easy to remove the sender and date received? Basically, I just want to have the subject of the e-mail and the link to the e-mail entered in TP3. Is it easy to remove the sender and date received ? Overall, I am happy with it, although I’d like to indent the msg.link with one more tab. Thoughts? My challenge is somewhat different, but related. I currently use OmniFocus to maintain my ‘Waiting for …’ list. When I send an email with a request, I Bcc my personal inbox at the OmniSync server. The subject of the mail becomes the name of the task, the content ends up in the task’s Note field. Could this be realised with Apple Mail on OS X and TaskPaper?